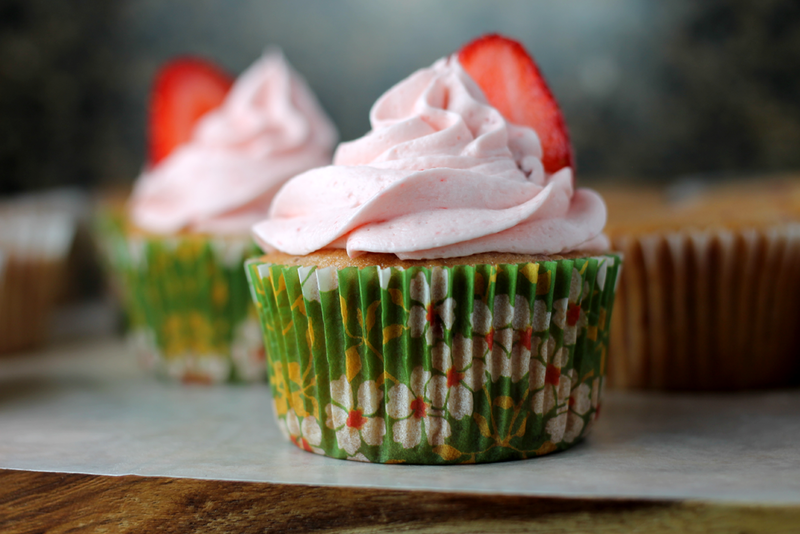 Why didn’t anyone tell me how awesome strawberry cupcakes are? I had to find out all by myself when I made some last weekend. 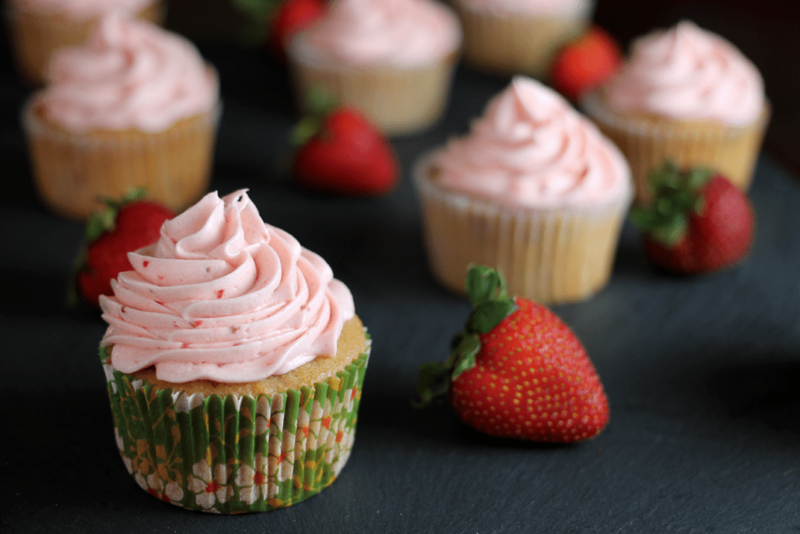 These cupcakes are made with lots of fresh strawberries and were perfect for our 4th of July BBQ (that we had on the 6th of July). If you bake a lot, you’ll probably have most of the ingredients around to make these, with the likely exceptions being fresh strawberries and cake flour. I happened to have some cake flour around from some long forgotten recipe, so I was in luck. Ah, and here we have the classic butter and sugar to kick things off. The butter and sugar are creamed together in a large bowl. Once it’s light and fluffy, the eggs and vanilla are mixed in well, followed by the flour/salt/baking powder mixture and milk. 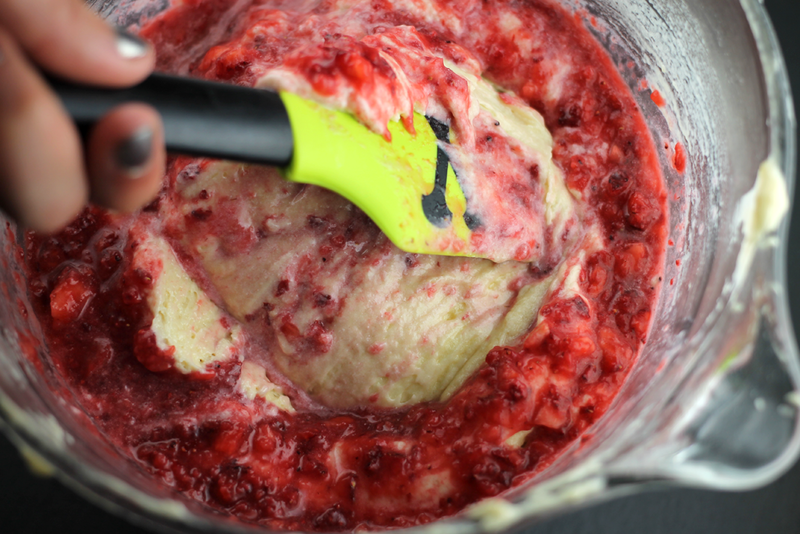 For the strawberries that are added next, you can either finely chop or semi-puree them in a food processor. I made two separate batches, making one each way, and they both were awesome. So, whichever way you want just depends on how big you want the bits o’ strawberry in your final cupcakes. For this one you can clearly see I went with the demolished strawberries option. I mean, semi-puree. Once the batter is all mixed up, line standard muffin tins with paper liners and fill 3/4 the way with the cupcake batter. You can also use a 1/4 cup of batter for each cupcake to make them all even. Then, toss ’em in a preheated 350 degree oven for 25-30 minutes. While those are baking, you can get started on your frosting. Butter, salt, vanilla extract, plus a whole lotta powdered sugar here. Oh, and pureed strawberries. Yes, more fresh strawberries! When the cupcakes are cooled, it’s time to dress ’em up with the pretty pink frosting. You can certainly spread it on by hand, but piping is crazy easy and looks all fancy-like. This piping tip is a 1M size star tip from Wilton. And done! Good luck keeping them around long. Preheat oven to 350 degrees. Line two cupcake pans with 18-20 standard cupcake liners. Sift both types of flour, baking powder, and salt together in a medium bowl and set aside. 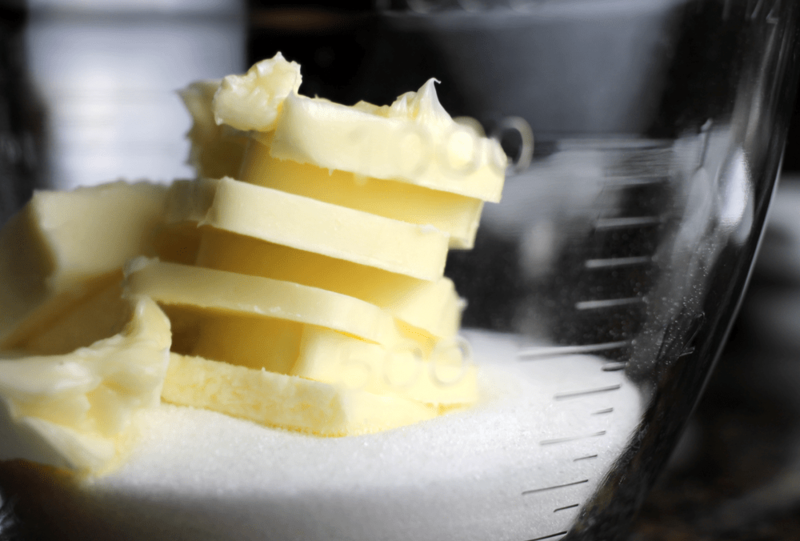 In a large bowl, cream the butter, sugar and vanilla extract on medium-high speed with an electric mixer. 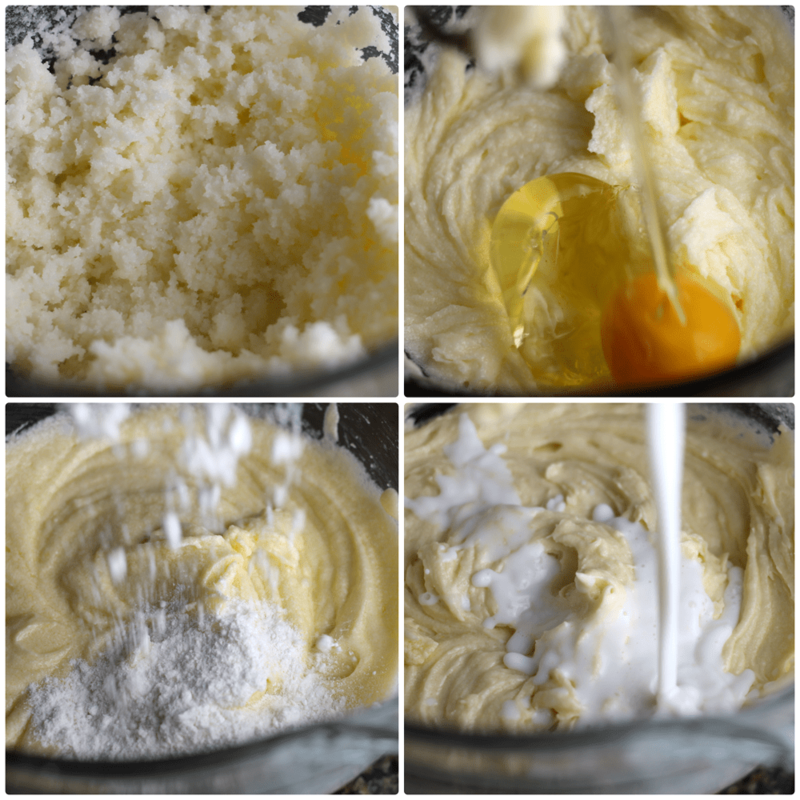 Mix until it’s light and fluffy, then add the eggs, one at a time, mixing well after each one. Add the flour mixture to the butter mixture in two batches, alternating with the milk, and beating on low until well combined. Fold in the chopped strawberries by hand with a rubber spatula until mixed in well. Fill each cupcake liner 3/4 full with the batter. 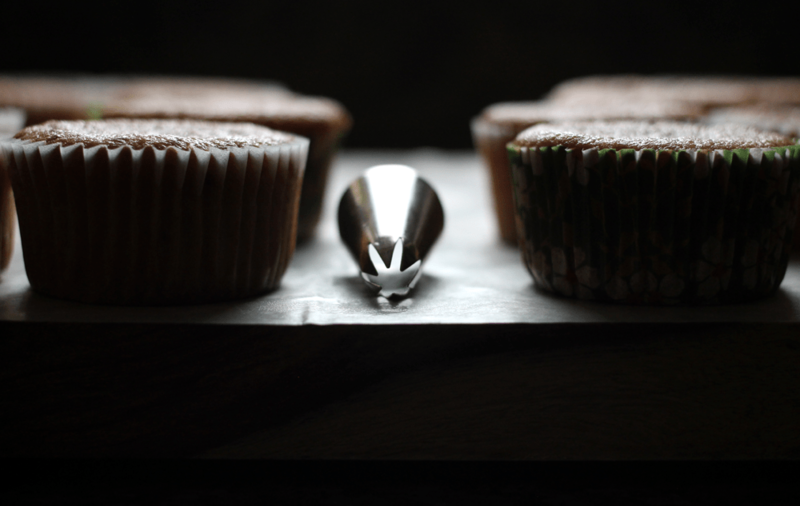 (Or, add 1/4 cup of batter to each lined cupcake… it should be about the same either way.) Bake both pans, rotating half way through, for 25-30 minutes, or until a toothpick inserted in the center of the cupcakes comes out clean. Cool completely and then frost with the tasty strawberry frosting below. 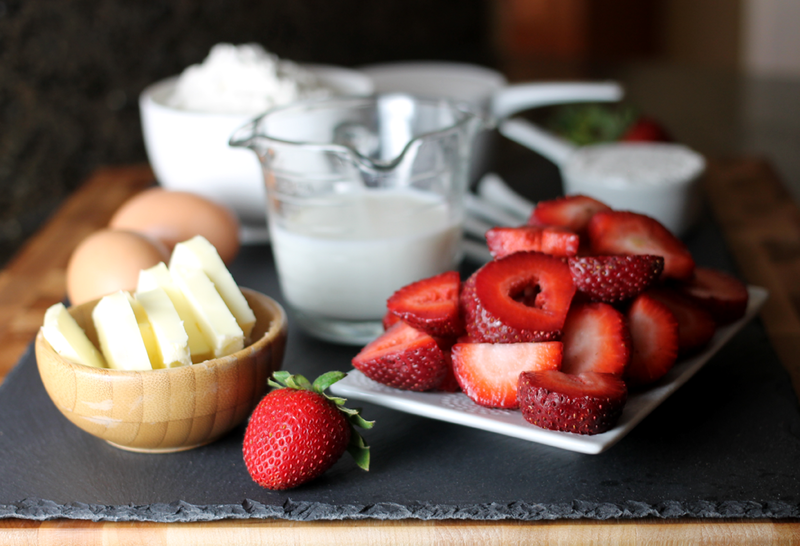 In a large bowl, mix the butter, vanilla extract and sea salt on medium speed until smooth and creamy. Add in the powdered sugar, little by little, until completely blended and light and creamy. 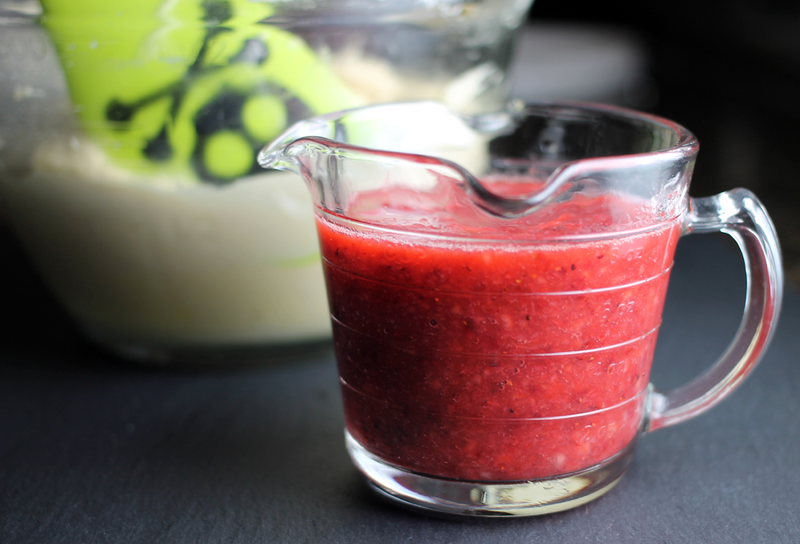 Then add in the pureed strawberries and continue mixing until mixed thoroughly.